Bhimbetka is an unique archeological site situated 2 km southwest of the tribal village Bhiyanpura in Raisen district, on the southern tip of the Vindhyachal mountains 46 kms south - east of Bhopal, the capital of Madhya Pradesh. Spreading over 10 km in length and about 3 km in width, this site has more than 700 rock shelters( the largest group in the world), each separated from the next by a few meters. The paintings in over 500 caves date back to about 9,000 years and depict the life of the prehistoric cave dwellers and a smaller number have evidence of Stone Age habitation from the upper Palaetholic period through the late Mesolithic and to the historical period, making the Bhimbetika group an archaeological treasure. The site, with South Asia's richest collection of prehistoric paintings, considered to be among the oldest Stone Age rock paintings in the world was declared a UNESCO World heritage site on July 2003, thus becoming the 22nd site in India to receive the status, along with other rock cut caves of Ajanta, Ellora and Elephanta. The name Bhimbetka comes from the Hindu Epic Mahabharata, Bhim-bait-ka means Bheem (One of the five pandavas ) had rested here when Pandavas were banished from their kingdom. 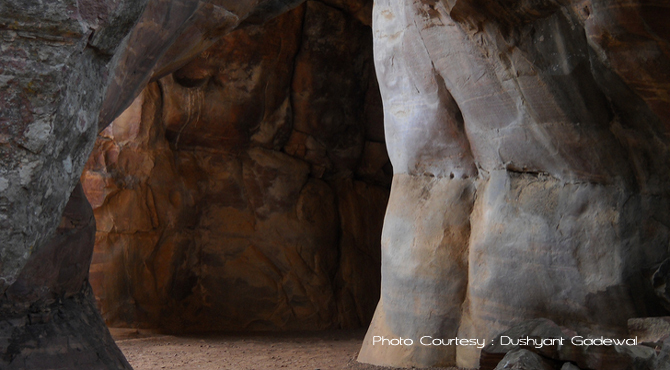 The Rock Shelters at Bhimbetka exhibit the earliest traces of human life in India. According to archaeologists, the caves must have been inhabited over 10,000 years ago. Surrounded by dense forests and rocky cliffs, the site is spectacular and is an Ornithologists paradise with its numerous bird species. Of the rock shelters, about 15 of them are open to the public. The first reference about Bhimbetka comes in 1888, when it was mentioned as a Buddhist site. 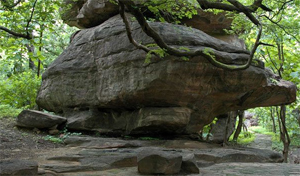 Then 70 years later in 1957, came the dawn for Bhimbetka, when this prehistoric rock shelters was accidentally discovered by an archaeologist, V. S. Wakankar (considered as the father of rock art in India) of the Vikram University, Ujjain. These shelters bear a significant similarity to Kakadu National Park (Australia), the cave paintings of the Bushmen in Kalahari Desert, and the Upper Paleolithic Lascaux cave paintings (France). Besides the paintings, the caves itself and some of the rock formations are also worth a look. One of the rock formations that looks like a tortoise, and the entrance of a cave which resembles the open mouth of a snake etc are truly amazing. Some of the main caves at Bhimbetka are fairly large which can accommodate up to a hundred people, while others are small. The rock shelters and caves of Bhimbetka have a number of interesting drawings about a foot high. It is a wonder that the paintings have not faded even after ten thousands of years. The cultural traditions of the inhabitants of the twenty-one villages adjacent to this site bear a strong resemblance to those represented in the rock paintings. The most famous cave at Bhimbetka is the 'Zoo Rock' where one can see paintings dating back to 10,000 BC and also some paintings made between 5,000 and 7,000 years ago. 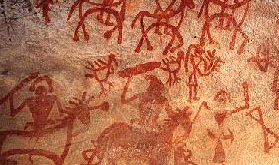 The cave paintings depicts the lives and times of the people who lived in the caves which include hunting and battle scenes (carrying bows, arrows, swords and shields), dancing, horse and elephant riders, animals fighting, honey collection, decoration of bodies, masking, various routine activities of the day etc. Popular religious and ritual symbols also occur frequently and the identified animals include rhinoceros, bisons, tigers, lions, deer's, elephants, antelopes, dogs, and lizards. These paintings are largely found on the ceilings and walls of the caves and on the rock face. The superimposition of paintings shows that the same canvas was used by different people at different times like Paleolithic (10,000 BC), Mesolithic (5,000 BC) and the Neolithic age (2,000 BC). It is believed that these paints were made of colored earth, vegetable dyes, roots, animal fat and the brushes were made of pieces of fibrous plants. Straight lines, squares, triangles, rhombuses, parallelograms and hexagons dominate the paintings. The colors used in the paintings are mainly red and white with an occasional stroke of Yellow and green. As by carbon dating, the white drawings suggests they are 5,000 years old, those in red are dated back at 8000 years. And the striped outlines are just 2,000 years old. Period One - Upper Paleolithic Era: Usually in white, green lines and dark red, with linear paintings of large animals like bison, tiger and rhinoceros. Period Two - Mesolithic Era: The Mesolithic figures and animals are usually in red and smaller. Hunting scenes are a common theme - which shows weapons, riding and hunting animals. Communal dances and musical instruments are seen in this rock shelter range. Women are sometimes seen with a child, or pregnant. Period Three - Chalcolithic Era: Similar to the paintings of Chalcolithic pottery, these drawings reveal that the cave dwellers had come in contact with the agricultural communities of the Malwa plains. Period Four and Five - Early Historic Era : The early historic figures have a schematic and decorative style. These images are painted mainly in red, white, and yellow and are mostly of riders, religious symbols and a highly stylized script. Some religious elements include tree gods, Yakshas and sky chariots. Period Six and Seven - Medieval Era : These paintings are geometric linear and more schematic, but they show degenerations and crudeness in their artistic style. The colours used by the cave dwellers were prepared combining manganese hematite, soft red stone and wooden coal.